This is just THE BEST color combo for a Fall/Autumn card and it is the color challenge for Create with Connie and Mary Thursday challenge this week. The colors are Hello Honey, Tangelo Twist and Blackberry Bliss and yes, you have seen me use these colors before! I do really LOVE them. I wanted to do a simple card that just really showed off the colors and here is my very simple card! Hello Honey grid print (Moonlight dsp Paper Stack) – 2 1/2 x 3 1/2 – the long end is 2 1/2 and the short end is 1 3/4. Add to card front. Add three strips of Blackberry Bliss 4 3/4 x 1/4. Once they are on the card, cut down so finished card size is 4 1/4. Stamp greeting using Tangelo Twist and Blackberry Bliss on Very Vanilla, punch out using Note Tag Punch, staple piece of Hello Honey Stitched Satin ribbon to top and add tag using dimensionals. This entry was posted in Clean and Simple (CAS), Create with Connie and Mary, Holiday Mini and tagged Fall Fest, Merry Everything. Bookmark the permalink. I agree that these colors are fabulous for fall! 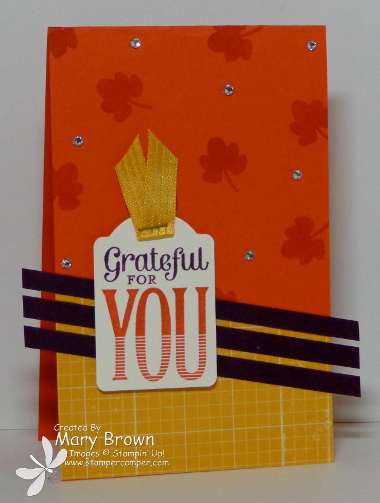 Your card is simple but the addition of the rhinestones gives it just enough “ta da”! I agree Mary – perfect fall colours! I love your unusual card layout with the overhanging strips – very effective, along with those tone-on-tone falling leaves. Another beauty, Mary! I’m really lovin’ the more narrow cards with the overhanging elements – so different and unexpected! Love what you did with the colors! This is a great CAS card! Love the tag! I will be CASE’ing this idea for my stamp club!! What a gorgeous crisp, clean card! I love the slender design with the stripes hanging over!